Fez El Bali is the heart of the Moroccan history and one of the rarest in the Arab world to have preserved the life of a medieval Islamic city. 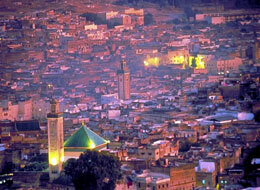 Built in the 9th century by Idriss I, the first king of Morocco, Fez is the first capital city of Morocco and the city that influenced the rest of the country as far as its history, culture, arts and spiritual life are concerned. The 9th century FES embodies a great number of medersas (schools) dating back to the 14th century and where you can admire the best of the old Moorish architecture, the Karaouin old university, the oldest in the world, built in the 9th century and specialized in Islamic Theology and medieval sciences. See the Sanctuary of Idriss II, the spiritual centre where this descendant of the prophet Mohammed was buried, and the recently restored NEJJARINE museum. 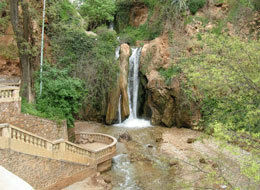 Fez El Jedid was built by the Merinid dynasty in the 14th century. Start with a drive around the beautifully restored ramparts before you stop to enjoy the most stunning view of the whole city from the hilltops of the southern part of Fes. Your cultural visit will then continue to the most beautifully built Jewish quarter which stands next to the 14th century Royal palace. This is the famous MELLAH, where you may admire a fine example of old Spanish-Moorish architecture; the Jewish cemetery, where the oldest tombs go back to the earliest days of the history of Fes and the region; as well as the recently restored synagogue of Aben Danan, built in the 17th century. Take a short walk in the historical gardens of Jnan Sbil and visit the 19th century Royal Palace, where a museum of Moroccan traditional arts is located. Your tour will end in the Northern part of the city to visit a 16th century fort which has been converted into an interesting museum. Drive across the Saiss plain to Meknes: a medieval city rebuilt by the king, Moulay Ismail, in the 17th century to become his capital. Being one of the Imperial cities of Morocco, Meknes offers the visit of various monuments: El Heri Souani, the granary and the stables built by the soldiers of Moulay Ismail next to a huge reservoir; the mausoleum of Moulay Ismail and its harmonious Moorish design; Bab El Mansour gate, the most beautiful in North Africa and an amazing combination of tile work. At the end of your visit take a walk to El Hdim square and visit its food market and the museum DAR JAMAI. In the early afternoon, drive north towards the mountains of Zerhoun to visit Moulay Idriss, the holiest town for the Muslims in Morocco, where the first King is buried. 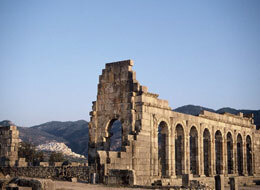 After that, start a walking visit of Volubilis, the Roman capital of Morocco built over two thousand years ago when this part of the country was a Roman province. Discovering the Roman part of the Moroccan history, you will admire one of the most beautiful collections of mosaics which have never been moved from their original site since their discovery in the early 20th Century. Late in the afternoon drive back to Fes via the village of Zgouta through a different part of this scenic countryside. A 30 minute drive will take you to Bhalil, an old Berber village where several families are still living in caves as their ancestors did centuries ago. Meet the local people and learn more about their way of life, history and traditions. During your visit you will undoubtedly be invited by a Berber family to savour a mint tea in their remarkable traditional home. From this Berber town you will be driven to Sefrou, an old fortified Jewish town, where the Jewish community existed before Islam was introduced in the 8th century. Situated at the foot of the middle Atlas, like a time-warp, life still goes here as it has since the medieval times. 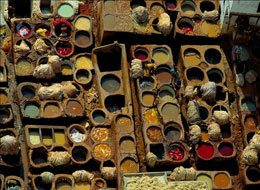 Visit the city walls, the Jewish quarter and the market place before you return to FES. 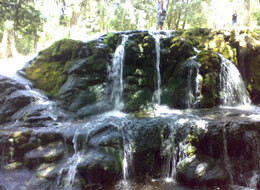 Take the southern road to the foot hills of the middle Atlas Mountains and cross Imouzzer, at an altitude of 1350m. This pleasant and beautiful region is inhabited by Berber people, the first inhabitants of Morocco, who still keep their own customs and language. From here you will be going to one of the several lakes of the Middle Atlas: Dayet Awa, where you will enjoy beautiful scenery before you reach Ifrane, the capital of this part of the middle Atlas, a beautiful city situated at an altitude of 1650m. Here the climate, the vegetation as well as the architecture could easily be mistaken for a village in the French Alps. Continue your drive across the Cedar forest and the Michlifen skiing resort to Azrou, a small Berber town where you will have a break before driving back to Fes.